As the saying goes, “if you don’t vote, the other person’s vote counts twice.” The midterm elections are next week, and I want to remind you of the importance of voting and the power you hold as a voter. Elections guide the direction of politics on a national, state, and local level and it is important that you have an impact on that direction. I encourage you to read up on ballot initiatives and to learn about the candidates and what they stand for before casting your vote. Ballots may be dropped off at Marsac from 7:00 a.m.-8:00 p.m. on Election Day, November 6. One of the beautiful parts of a democracy is that all votes are valued equally regardless of who they’re coming from. So get involved, get out, and cast your vote because it counts! Park City Council met during a regularly scheduled meeting on October 23, 2018. Agenda items included the request to authorize a contract with Proterra, Inc to purchase seven new electric buses, suggested issuance of RFPs for food trucks, and the announcement of Park City Community Foundation as the City's Social Equity Community Convener. Read the full summary here. The paving portion of the Prospector Avenue project is complete and the first application of paint striping has been placed. A second application of paint will be applied in roughly two weeks. The one way traffic configuration is still in place. Please follow orange barrels and cones proceeding westbound. 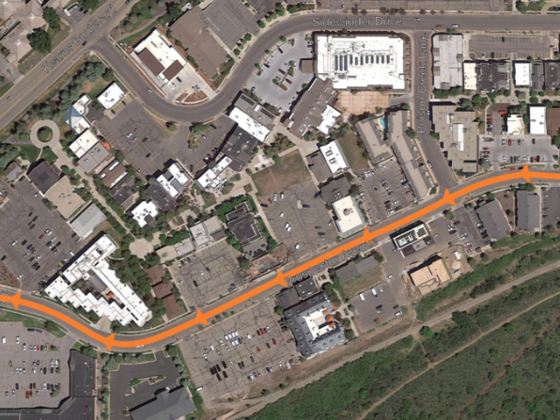 Final sidewalk additions and landscape construction are anticipated to wrap up mid-November. For more information about the project, visit the City's "Current Construction" page. Park City Municipal Corporation is excited to announce the selection of Park City Community Foundation to serve as the Social Equity Community Convener. In this role, the Community Foundation will facilitate collaboration between local nonprofits, advocates, and partner organizations to identify pressing social equity challenges facing our community and develop a strategic action plan to address these needs. Full press release available at parkcity.org. Park City Municipal Corporation seeks proposals to implement a comprehensive community visioning project to engage, invite dialogue, and summarize the vision, direction, and identity Park City residents would like to achieve. The City’s goal is to clearly define a vision for our community that can serve as a blueprint for growth over the next decade. Proposals must be submitted by Friday, November 9 at 4:00 p.m. More information available here. Park City has opted in to a new financing program from the Governor’s office of energy development. C-PACE, also known as Commercial Property Assessed Clean Energy, provides zero down and up to 100 percent private financing for up to 30 years for commercial building improvements. Improvements can include energy efficiency upgrades, renewable energy systems, water conservation measures, seismic upgrades, hybrid elevators and escalators, electric vehicle infrastructure, and parking automation. C-PACE is a great option for building owners who want to upgrade the energy efficiency of their property, and developers looking to install above-code efficiency improvements. Find out more by visiting the C-PACE website, or get in touch directly and we will help you navigate the process: celia.peterson@parkcity.org. Park City Municipal Corporation is seeking a City Engineer. This position, which falls under the City’s Community Development Division, works alongside the Building and Planning departments to oversee development and future planning for growth established by City Council and the Planning Commission. More information about the position and the application can be found here. The City has a variety of other job openings, including part-time/seasonal jobs and several full-time positions. Explore the opportunities and apply for open positions at parkcity.org or visit this link, which highlights current openings. Park City Municipal is leading the charge against climate change. Please help us understand how to best mobilize our community to make the shift to net-zero carbon emissions. Your feedback, via this survey, is valuable to us.